Transferring property can be a complicated process. Whether it’s a foreclosure, buying a new property, or transferring property between family members, deeds are used in every real estate transaction. Quitclaims are not your typical general deeds, so you must understand what they are and in what circumstances that they are used. Let’s look at deeds in general and learn just what you need to know about quitclaim deeds. Many years ago, the act of transferring land occurred ceremonially through a “livery of seisin.” The person transforming the property gave a clod of dirt or twig to the person taking over ownership of the property. Sometimes a written note or verbal statement was given to the new owner as well, but the legality of the transaction resided in the “livery of seisin.” Today, things are done much less ceremonially through the conveyance of a deed. There are three types of real estate deeds in use today; the special warranty deed, the quitclaim deed, and a general warranty deed. Of course, the warranty deed is the most common one used in real estate transactions and essentially grants the owner of the property the right to transfer it to the new owner. It also functions as a statement that assures the new owner that the property has no liens against it from a creditor, the IRS, or a mortgage lender. The warranty deed protects the buyer the most. Also, it serves as an acknowledgement that the land cannot be claimed by another person. The deed serves as a protectant for the new owner that he’ll be compensated for any losses if another person successfully challenges his ownership. The special warranty deed addresses any problems or defects that occurred during the time that the seller owned the property. 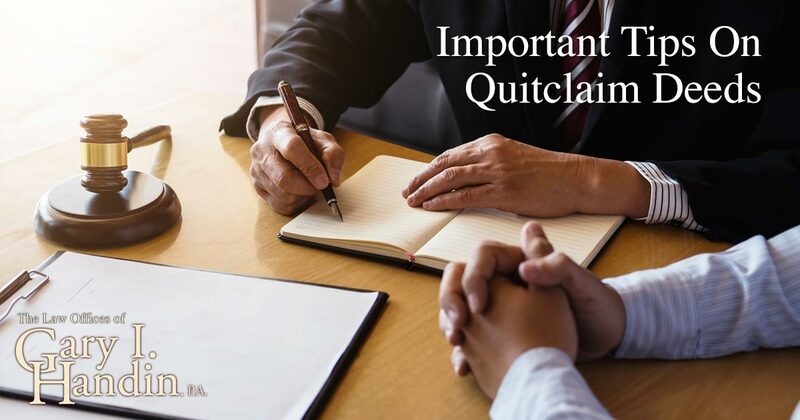 Quitclaim deeds are commonly used to correct a defect on a title like the misspelling of a name or to transfer property between members of a family. It typically provides the least amount of protection to the new property owner and because of this it’s often called a non-warranty deed. There is no title insurance issued, and usually no title search is performed for ownership verification. These deeds are very common but are usually only used when the people involved in the transaction know each other. It’s essential that you only accept quitclaim deeds from people that you trust. That’s why they are utilized in transactions that are considered low-risk. Quitclaim deeds are also used when the transfer of ownership happens without selling the property or no money changes hands. This type of deed can be used when a property owner gets married to add their spouse’s name to the title or when there is a divorce, and someone’s name needs to be removed from the deed. It may also be used if a parent transfers property to an adult child or between siblings. These deeds only serve to transfer the previous owner’s interest in the land to the current buyer. If the seller outright owns a property, a quitclaim deed transfers their whole interest to the buyer. One key thing to remember is that quitclaim deeds only affect the name listed on the property deed and the ownership of it and do not affect any mortgage that may be on the property. It’s critical that you understand just what you are getting into with a quitclaim deed. It may look simple, but must meet certain requirements. It is easy to make a fatal mistake that can cost several thousands of dollars to correct, when and if, in the future, the property is sold. If you have any doubt hire a professional to make sure that your rights are properly represented. With virtually no warranty or protection, a quitclaim deed is inappropriate in many real estate transactions.